WEST LAFAYETTE, Ind. — Purdue is acting as if building world-class supercomputers is the newest college sport. For the second year in a row, Purdue will build what is expected to be the Big Ten’s largest campus computer, and as before, it will be running jobs by the end of the day. “Coates,” the new supercomputer, will be built from more than 10,000 computer cores, or processors, versus Steele’s 6,500 cores. Coates is also expected to be the first internationally ranked academic supercomputer that is wired solely by superfast ten-gigabit network connections—allowing it to more easily handle the large amounts of data produced by research areas such as climate modeling and weather forecasting. On July 21, more than 200 information technology staff from Purdue will gather to construct the room-sized machine. They are expected to be joined by colleagues from the universities of Michigan and Iowa, as well Michigan State University and cross-state rival Indiana University, who will be observing and participating in the construction. To generate excitement on Purdue’s campus and elsewhere, the IT staff created a parody movie trailer, “Cores,” which is a take off on the Pixar movie hit “Cars.” The video can be seen below. The Big Ten’s largest campus computer is currently at the University of Minnesota’s Supercomputing Institute, which was ranked 59th in the June 2009 list, eclipsing Steele, which topped the list in its first benchmarking for the November 2008 Top 500 list. In that ranking, Purdue’s Steele was the Big Ten’s largest computer, ranked 105th in the world. Supercomputing technology progresses rapidly, however, and six months later, in the June 2009 Top 500 list, Steele has moved from 105th to 196th. 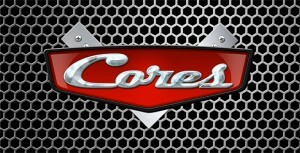 Coates will be built with 1,280 HP dual quad-core computer nodes using AMD processors, and Cisco and Chelsio network equipment. It is expected to have a peak performance of 90 teraflops. Coates, like Steele, is being built as a “community cluster,” in which faculty on campus contributed research funds to fund the purchase, says John Campbell, associate vice president for Rosen Center for Advanced Computing at Purdue. The new cluster is being named for Clarence L. “Ben” Coates, head of Purdue’s School of Electrical Engineering (now Electrical and Computer Engineering) from 1973 to 1983. Coates retired in 1988 and died in 2000 at age 76. Coates was a driving force behind high performance computing at Purdue. “Naming our research clusters after former Purdue IT leaders gives us a way to recognize the contributions of these great people,” McCartney says.